MARY WHITE MORRIS wrote again from Aberdeen, Maryland (see previous post), where she had fled with her children against the expected advance by the British on Philadelphia in the winter of 1776, to her husband Robert who had remained behind. We had been for many Days Impatiently wishing for a Letter from you, as the News we hear from any Other Quarter is not to be Depended on, but when the Welcomed one arrived, which brought those glad Tidings [probably news of Washington’s successful attack on the Hessians on the day after Christmas], it more than Compensated, for what our late Unfortunate Curcumstances, Prepared our Minds to Expect, which was Nothing more, then our Armys being on the Defencive, and fearing least their Numbers were not even Equal to that, but Retreat as Usiall, but I hope indeed the Tide is turning, and that our Great Washington will have the Success His Virtues Deserve, and Rout that Impious Army, who from no Other Principle but that of enslaveing this Once Happy Country, have Prosecuted this Cruell War. [M]y Father was greatly, tho Agreably Affected, at such good news, and I was the Happy means of makeing many joyfull Hearts, as we had many Guests added to our large Family to Celebrate Christmas. . . .
Pray were do you Lodge, I was told at Mr. Beveridge’s Country House, for Security, if I Exact all I wish to know I’m Affraid youll write the Seldomer, but Remember, it’s the greatest Gratification I can have, till I see you. . . . Bob walkd 3 miles to School today with one of his Cousins, I take a great deal of Pains to Preserve their Learning, Anna was right about my Shifts, but my needles I left in the tea Tabel [sic] drawer, put them there Myself, intending to put them in my Pocket the last thing. . . .
Robert Morris Collection: Henry E. Huntington Library, Lists No. 5, pages 53-55, transcribed by Louise North. [Microfilm, courtesy of Dr. Elizabeth Nuxoll]. 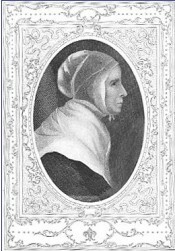 Margaret Hill Morris, the eighth daughter of Dr. Richard and Deborah Moore Hill of Maryland was raised by her older sister Hannah in Philadelphia. At twenty-one, she married William Morris, Jr., a dry-goods merchant, who died in 1765, leaving her with three small children and expecting another. After struggling for some years to provide for her family, Margaret decided to move in with her sister Sarah Moore Dillwyn, wife of the Quaker preacher George Dillwyn, who lived in Green Bank, New Jersey. The house overlooked the Delaware River. Another sister Milcah Martha Hill Moore lived nearby. As warring factions approached Philadelphia, people fled their homes seeking safety. Milcah Moore moved her family north of Philadelphia. Margaret began a Journal to amuse her sister, commenting on events that were unfolding around her. The Journal begins in early December 1776, as General Cornwallis and his army marched through New Jersey, the British fleet blockaded the Delaware, and General Washington and his troops fled into Pennsylvania. On the river near Margaret Morris’s house “galleys” or “gondolas” of the Pennsylvania navy were positioned to prevent the crossing of British troops. Here are several entries from Morris’s Journal in late December.
. . . to day (the 22d) we hear Gen: Howe is at trenton, & it is thought there will be an engagement soon. . . . We hear this afternoon that our Officers are afraid thier Men will not fight & wish they may all run home again. A peaceable Man ventured to Prophesy to day, that if the War is continued thro the Winter, the British troops will be scard at the sight of our Men, for as they Never fought with Naked Men, the Novelty of it, will terrify them & make them retreat, faster than they advanced to meet them, for he says, from the present appearance of our ragged troops, he thinks it probable, they will not have Cloaths to cover them a Month or 2 hence. . . .
27th—a letter from Gen [Joseph] Read to his br[other: Bowes Reed]—informing him that Washington had had an engagement with the Regulars on the 25th early in the Morning, taking them by surprize, killd fifty, & took 900 prisoners. The loss on our side not known, or if known, not sufferd to be publick.—It seems this heavy loss to the Regulars was oweing to the prevailing custom among the Hessians of getting drunk on the eve of that great day which brought peace on Earth & good Will to Men—but oh, how unlike Christians is the Manner in which they Celebrate it, can we call ourselves Christians, while we act so Contrary to our Masters rules—he set the example which we profess to follow, & here is a recent instance that we only profess it; instead of good will, envy & hatred seem to be the ruling passions in the breasts of thousands. This evening the 27th about 3000 of the Pensylvania Militia, & other Troops landed in the Neck, & marchd into Town with Artillery, Baggage &c, & were quarterd on the inhabitants, one Company were lodged at J Vs & a guard placed between his house & ours, We were so favord as not to have any sent to our House. An Officer spent the Evening with us, & appeard to be in high spirits, & talkd of engaging the English as a very triffling affair, Nothing so easy as to drive them over the North River &c—not considering there is a God of Battle, as well as a God of peace, who may have given them the late advantage, in order to draw them out to meet the Chastisement that is reservd for them. The Journal entries above can be found on pages 101-102 of In the Words of Women. Disappointed that her cousins Isaac and John Mifflin did not accept her invitation to Christmas dinner in New York, Hannah Thompson wrote again to John on December 28 describing a wintry practical joke. I suppose Aunt Norris for your entertainment, on Christmas Day, told you of the Slaying [sleighing] match that Mr. Houston in Second Street gave his Daughters. Dear Papa dear Papa do give us a Slaying—at last he consented, told them to get ready and dress themselves warm, Which they accordingly did and came running. We are ready papa; he ordered the Servants to have some burnt Wine against they came back. He desired them to step up stairs with him before they went; as soon as they got into an Attick Chamber, he threw up all the windows, and seated them in two old Arm Chairs and begun to Whip & Chirrup with all the Spirit of a slaying party. And after he had kept them long enough to be sufficiently Cold, he took them down & cald for the Mulled Wine, and were all very glad to sit close to the fire and leave Slaying to those that were too Warm. Compliments of the Season to Cousin Isaac & yourself, and send you each a Cookey as you wont come here to eat them. This excerpt is from In the Words of Women, pages 226-27.